If you have a missing tooth, a dental implant offers a permanent solution with many advantages. Implants give you the base for a strong, lifelike tooth that will look and feel like your own. Missing even just one tooth can be quite distressing. There are alternatives available to remedy this problem; however, a dental implant offers the most superior solution. Bone preservation: A dental implant keeps your jaw bone healthy and strong, as it takes the place of a tooth root, preventing bone resorption (degradation) that is experienced with missing teeth. No interference with healthy teeth: An implant doesn’t sacrifice the health of adjacent teeth. Often, when a dental bridge is required, the neighbouring teeth need to be ground down to support the cemented bridge. However, with dental implants, there is no need to disturb the surrounding teeth. Hygiene: Dental implants also make it easier for you to keep your teeth clean. There is no need for special cleaning devices – you simply clean your artificial tooth as you would the rest of your teeth. Aesthetics: In the long-term, a dental crown will look nicer and more lifelike than a bridge. The gums around the bridge tend to recede over time, resulting in a visible defect where the metal base of the bridge becomes exposed. Also, the resorbing bone underneath the bridge can result in a less than attractive appearance. Preventing damage and decay: The cement that holds the bridge in place can wash out over time. This allows bacteria to damage and decay the teeth that are holding the bridge in place. 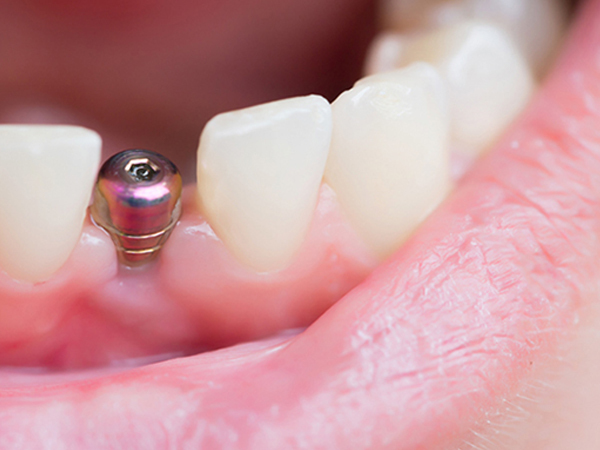 The TGA approved titanium implant resembles a small screw. It is placed into your jaw in a procedure that usually takes no longer than an hour. It’s likely that your dentist will give you a temporary tooth replacement to wear until your dental implant has integrated into the jawbone in a process known as osseointegration. You can expect to have some tenderness in the implant area for one to three days. 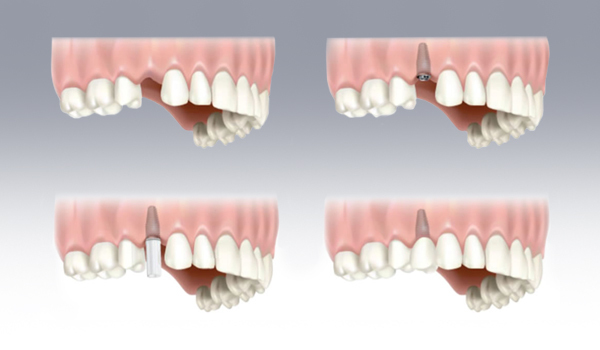 What’s involved in a single implant procedure? You will have an initial consultation with our dentist. 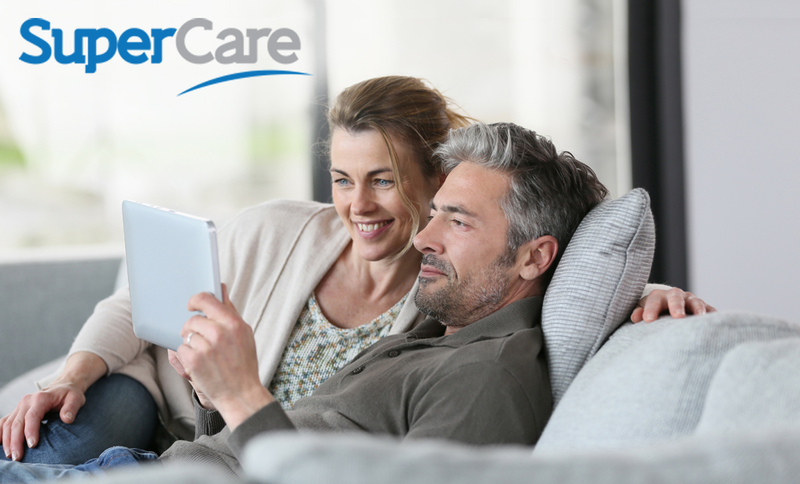 Here, you can discuss your condition with your dentist at length, get all your questions answered, and have any x-rays required. If you both agree that inserting a dental implant would be the best course of action for you, your implant procedure will be booked. Usually, the implant will be inserted at one of our Dentistry Plus Perth dental clinics, in the chair. You will be given plenty of anaesthetic and even sedation if preferred. An abutment will be added to the implant. An abutment acts as a joiner between the implant and the artificial device. When the implant has set securely in your jaw bone, your dentist will give you a replacement tooth, known as a dental crown. This will be made in a shade that best matches the rest of your teeth and attached to the abutment. Before long, your new artificial tooth will feel (and function) just like your normal teeth, giving you back your confidence and ability to bite and chew freely.